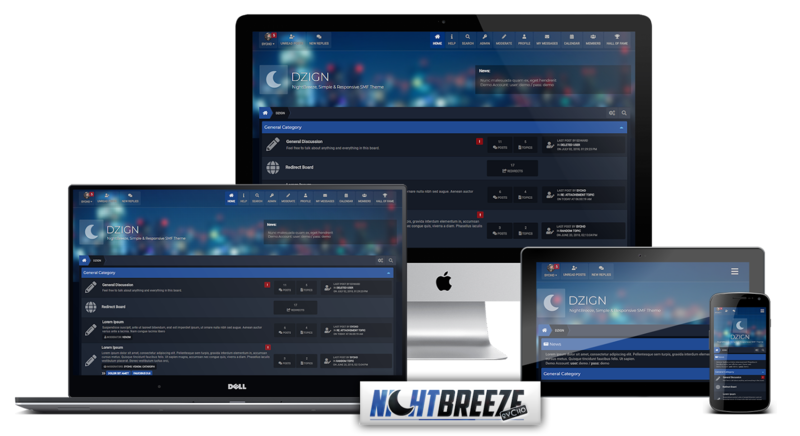 NightBreeze, is a Dark Simple & Responsive SMF Theme, For Free. I think I like this one even more than the other one you released first, and that's saying a lot coming from me, as I don't usually like dark themes. Thank you so, so much for releasing these themes. I am going to be using this on my next look change! Q: Is there any way to change the width of this theme? I usually have mine around 80%, and I cannot see a place to change it (in the theme's options on admin panel). Something odd happened while testing this theme on my forum... Some categories move to the right, it's mostly those below categories with child forums. How can it be fixed? Thank you!!! Thanks for fixing it so quickly. Great work . Another great theme . Very nice theme , i simply love it . I have a couple of question , what dimension is header image , cause i've change it and it looks strech and zoomed . Also, i wanted to change the logo , i did it with url link but i want to upload it from my computer not external link , it is posible? Great job I liked the theme! One of the nicest themes i've seen for smf! This is a gorgeous theme, in fact I'm using it on my forum right now. Is it possible to change theme colors in theme settings without editing CSS? ... Is it possible to change theme colors in theme settings without editing CSS? If you don't use a logo in the header (just the site name/text) the start of the white text gets a little lost in the header background. Not sure what you can do about it... although most folks are going to have a logo anyway. 2- ah, no... did not reload at that size, just shrink and grow the browser windows width to simulate different widths.